RVs are a serious investment from the start. The average RVer drops anywhere from several thousand dollars to a few hundred thousand dollars to hit the road and travel where others never go. We take these RVs to everyday parks and campgrounds to relax and enjoy the sights and amenities. Like anything else, some RVers step up their game, dropping much more to get the RV of their dreams and travel in luxury. Where do these people take their RVs? While some may be content with a mom and pop RV park, others like to match their park with their ride at ultra-luxurious RV parks, and that’s what we want to explore today. Let’s get a glimpse at high-end RV parks, often known as RV resorts. So, What is an RV Luxury Resort? There are no set criteria that separate your typical KOA site from a stay at an RV resort, yet there are some immediate differences. First, we start with the word “resort” compared to an RV park. Now it is true anyone can call their RV park a resort and get away with it, but it doesn’t happen all that often. 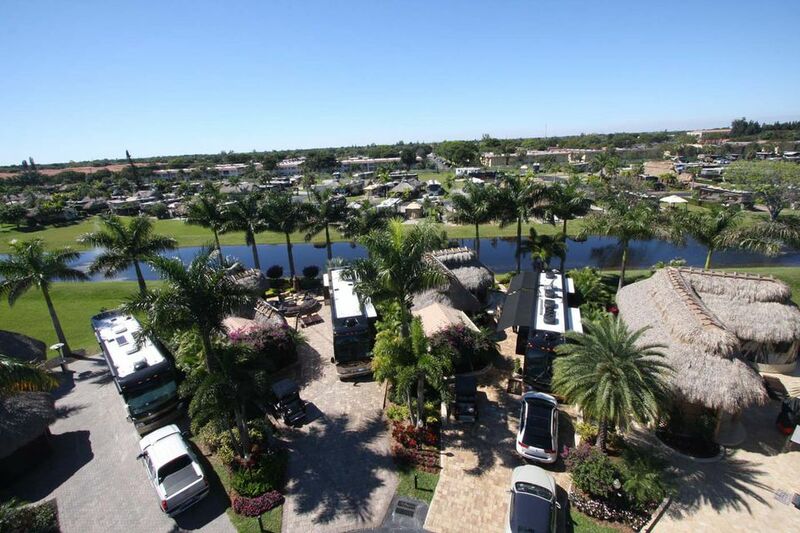 Most RV park owners are content with calling their park a park while RV resort owners want to convey the high-end quality and amenities that come with an RV resort. Resorts may often say that the RV park is meant for long-term parking so if you want to know if a park is a high-end resort look for the words, they use to describe the park like luxury, high-end, first class or other rich sounding words. One sure fire way to gauge if it is a resort is to find out what types of RVs are allowed there. If it is only class A motorhomes or motorcoaches, you’ve found a luxury resort. A spot at an RV resort is going to cost you a pretty penny, so you bet that the RV pads are going to be outfitted. Pads at RV resorts will often be spacious and able to handle some of the biggest RVs on the road. They will almost always be equipped with full utility hookups and will likely come with other unique amenities such as large patio areas, outdoor kitchens, private outdoor showers, hot tubs, elaborate landscaping and more. You will not be crowded by your neighbor either as spaces tend to have plenty of room for privacy. RV sites are a far cry from the pitted crushed gravel sites of your backwoods RV parks. You’ll also notice a difference in demographic at RV resorts, which tend to cater to older travelers and retirees. You wouldn’t be able to call it a resort without some great amenities. RV resorts can vary with what types of amenities they offer. You will likely have resorted standbys such as crystal clear swimming pools, hot tubs, saunas, spas, dog care, 24-hour security and more. That’s the tip of the iceberg as some RV resorts may come with high-end amenities like private golf courses, staff that will clean your motorhome while you’re out, on-site entertainment and more. The type of luxuries will depend on the individual resort, where it’s located in the country, and how it was built in the end. Pro Tip: Look for resorts that have the luxuries you want. Just because it says it’s a “luxury resort” doesn’t mean it has the luxury you’re looking for on you vacation. How Much Will an RV Luxury Resort Set You Back? This one comes with some good news and bad news. The bad news is that many RV resorts sell their spaces and don’t rent them daily as most good old-fashioned RV parks do. Price tags can range anywhere from a couple hundred thousand dollars to over seven figures for the most luxurious. The good news is that there are RV resorts who will allow you to rent spaces with reasonable daily rates from around $100 to $500. Check the price of an RV resort before you decide it’s too rich for your blood, you might be surprised. In most cases, staying longer at an RV resort will save you money despite the price tag attached. Keep that in mind as you’re planning destination trips and long stays in some of your favorite places across the country. Pro Tip: Depending on when you’re traveling, summer and winter months will be the most expensive at resorts. You’ll need to book early and book quickly to ensure you get a pad at most resorts, especially in states like Arizona and Florida. Should You Stay at an RV Luxury Resort? If you have the motorhome and the cash, RV resorts are something worth trying if you can find a resort to stay at for a shorter trip. Even though you may own a Class A motorhome or motorcoach, you may not appreciate everything an RV luxury resort offers. Many RVers prefer to hit the road, explore the world around them, and use the freedom a motorhome or trailer provides to get away from it all. For others, the idea of parking their RV in a luxury getaway near or far away from home is the type of “travel” they’ve been seeking. One of the best things about RV luxury resorts is if you buy a lot or invest in a long-term rental, you often can take your motorhome out here or there with little hassle. This gives you the flexibility to come and go as you please but also stake down roots at a home away from home. Staying at an RV resort should be something on everyone’s RV bucket list. Even if you find out this type of RV adventure isn’t what you’re looking for, it’s one more experience you’ll find out on the road after investing in a motorhome or trailer to travel.